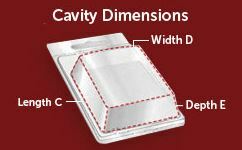 The first step in specifying a clamshell is to determine if a clamshell package is the best package for your application. 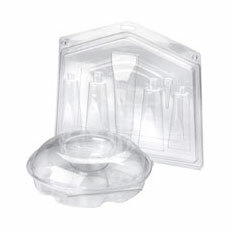 As a general rule, clamshells are specified for their excellent product display attributes and theft resistance qualities. 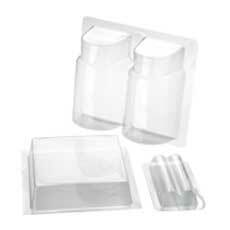 Another huge benefit is that clamshells do not require any special equipment to pack and seal them. They typically hold much heavier items than blister packs and don't require extensive graphics like corrugated packaging. This is the easiest place to start as many other decisions will evolve from what size package you need for your product. You should also consider whether or not this package will be used for a single product or if it needs to be designed to hold a variety of different sized items. Thicker walls are often needed to package heavier items. Thinner walls can often be used to package light weight items. Thicker wall are often specified as they provide more protection and resist damage better, but increase the cost. 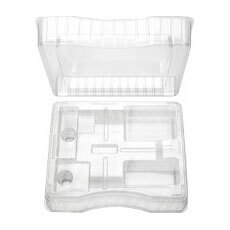 One can sometimes use thinner walled packaging by adding corrugated or foam inserts to the shipping containers. 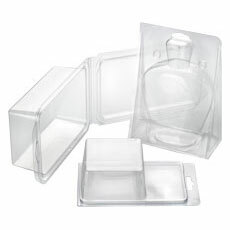 Many companies choose clear clamshells because consumers can see the product inside of them, but there are often still needs for graphics and some merchandising. Determine how much “header card” space you will need to adequately describe your product, show your logo, product features, etc. Once you have identified your preferences for each characteristic, you will have to evaluate the costs (both one time and ongoing) involved to determine whether or not the price of your product can support the use of the clamshell package you have specified. Given the many options available, it is often helpful to work with a VisiPak specialist to aid you in this process.